Head coach Mike Brennan spoke to the media after American’s 65-59 loss to Army, which dropped the Eagles to 7-17, 5-8 in the Patriot League. 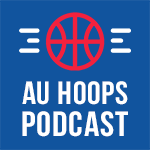 What was the difference in how AU played vs. Army this time vs the first time? Is Ferguson someone you can point to when talking to young big guys about where they can get to in terms of a big who’s really progressed from year to year? On the past 4 opponents; Patriot League’s top teams starting to flex muscle and respond to ‘Patriot League being down’?